Sweden has a population of just under 10 million and 7.49 million were registered to vote in the general election last Sunday. There were 6005 polling stations so each polling station would deal, on average, with less than 1300 voters. As a comparison, an Indian General Election has 814 million voters and 930,000 polling stations giving an average of less than 900 voters per polling station. On average a Swedish polling station has 50% more voters than an average Indian polling station. 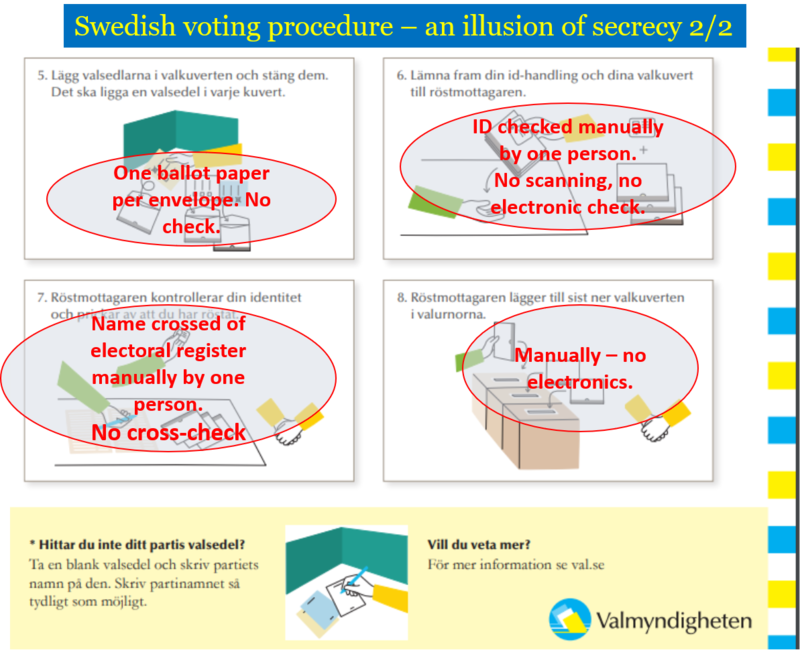 Yet the Swedish voting procedure is almost entirely manual with very little use of electronic devices. Surprisingly, it is also prone to human error in the recording of who has voted. The voting process has five key steps. Mark your preference for a particular person on the party list. (IN SECRET). Put your ballot paper in an envelope. (IN SECRET). 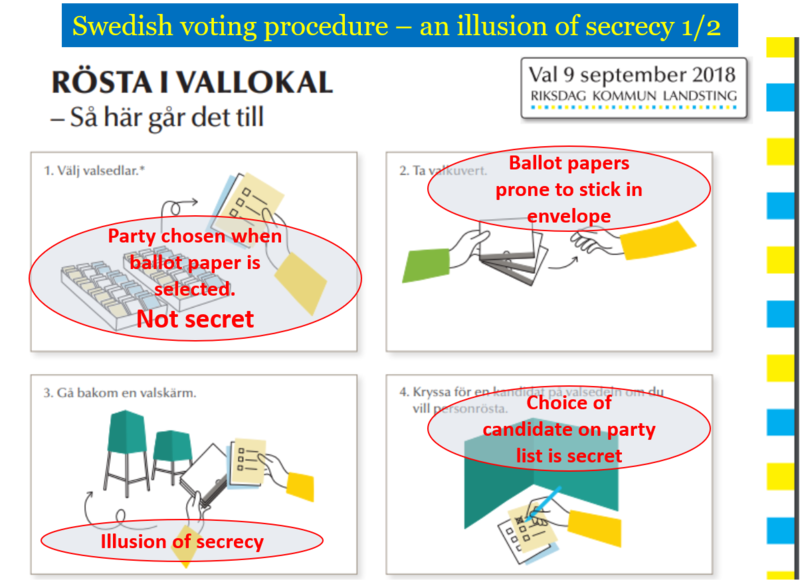 places your envelope in the ballot box (NOT IN SECRET). The voters choice of party is made in Step 1 but there is no pretense of secrecy around this step. The secrecy surrounding Step 3 adds no value. In Step 4 there is no cross check that the name being crossed of the electoral roll is actually the person who has voted. Considering the voting process as a whole, it is remarkably old-fashioned but steps 1 and 4 are not fit for purpose for even an old-fashioned process. This year the Swedish election has had international observers. I would be surprised if they did not comment on Steps 1 and 4. The Swedish general election takes place in about 2 weeks and it is almost impossible to avoid stupid pronouncements by politicians of all colours and all parties. There is not a single media outlet which does not have its own agenda. Some openly support a particular party. Others are more sophisticated and oppose particular parties. The most intelligent keep their preferences hidden but support or attack particular policies which, on balance and by a strange coincidence, just happen to be those of a particular party. But there is not a single one which does not have its own agenda. But the worst thing is the oozing, sickly sweet stench of political correctness. Stupidity is in the air. As a second class immigrant, who should I vote for in the Swedish election? I have observed that in a Red/Green Sweden I am now a second class immigrant. I did not ask for or get “political asylum”. I came to Sweden – horror of horrors – to work. I did not seek, and I did not get, social welfare payments. 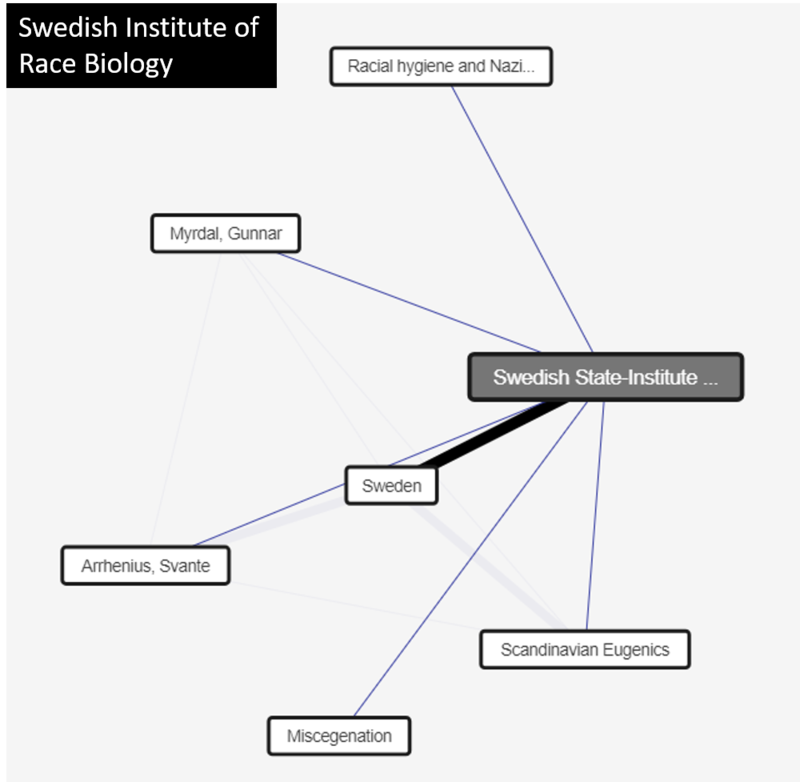 I am of Indian origin and I was working in England in R & D when I was “recruited” to Sweden 34 years ago. At that time it was still the old Stal Laval which became ASEA Stal and then ABB Stal and then later Alstom and then Siemens. In due course we became Swedish citizens. Now as we approach the 2018 general election I must decide who to vote for this time. There are actually many parties not worthy of consideration. The Environmental Party is made up of children trying to be adults. They are so sanctimonious they make me ill. The Left party is just another Communist party masquerading as socialists. The Liberals and the Centre and the Christian Democrat parties have no idea what they really stand for and are “dead men walking”. The Greens, the Left, the Liberals, the Christian Democrats and the Centre are excluded from any further consideration. That leaves three. For the Social Democrats, I am a second class immigrant because I came to Sweden to work and not for “political asylum”. Moreover they have not understood the difference between multi-ethnic and multicultural. Parallel cultures always give a fractured society. They want to tax me even more for very questionable projects. They have confused sameness with equality. They have made a false God of “equality” without understanding that fairness and justice demands unequal treatment. I find Stefan Löfven uninspiring. They may well win the election but they are probably not for me. The Sweden Democrats would prefer that I am not here. Jimmy Åkesson has actually developed more over the last 10 years than any of the other political “leaders”. He has more charisma than any of the others. 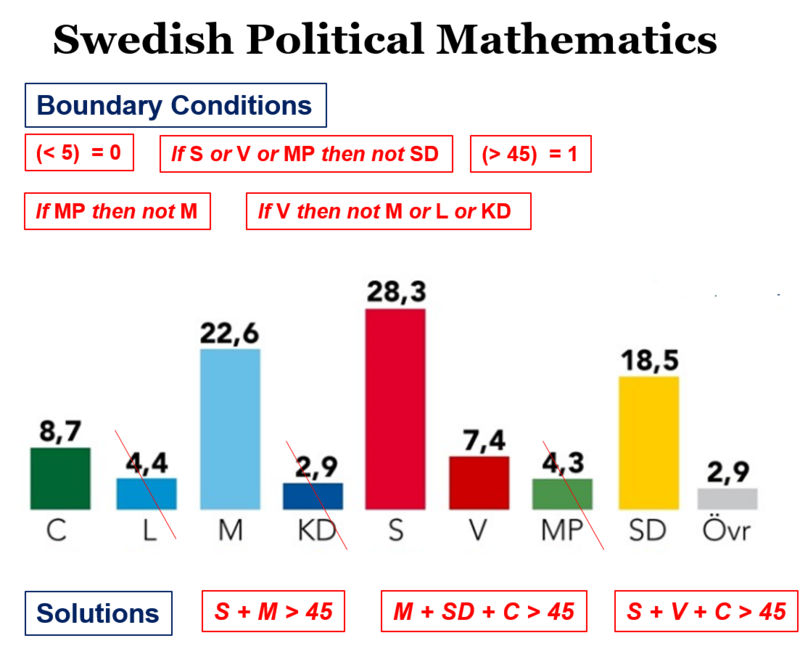 On many issues, except the treatment of immigrants, I am actually closer to the Sweden Democrats than to many of the other parties. But they don’t like any immigrants of any kind and therefore I am not for them. The Moderate Party should be where I can naturally find a home. Generally, but mainly in theory, they are closer to my views on labour and the economy and free enterprise. But they lack courage and they lack leadership. 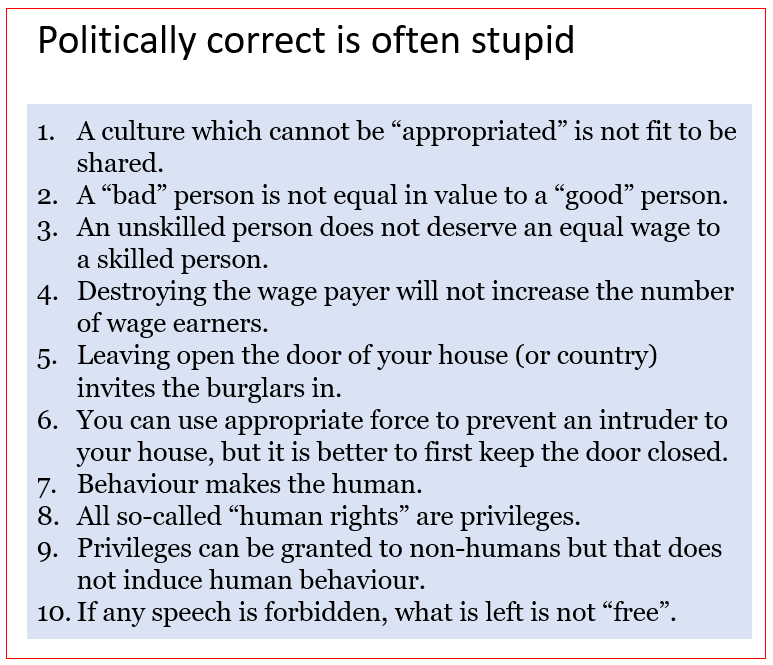 They are so enslaved by political correctness that they are prepared to go against their own principles whenever the wind blows against them. Ulf Kristersson is solid enough but quite bland. He could grow up but he hasn’t done so yet. I don’t have any good choices – only less bad ones. I think the Social Democrats are unlikely to get my vote for just being too unintelligent. The Moderate party is possible as being the best of a poor lot but it could be a wasted vote. Or I could vote for the Sweden Democrats in the hope that an earthquake will result and that out of chaos can come order. The Swedish General Election is coming in September. The traditional parties are being confounded by the growth of the Sweden Democrats. The Social Democrats are particularly upset that even though their immigration policy now is almost identical with what the Sweden Democrats have proposed in the past, they are losing support. The Greens (Environmental Party) have no soul, very little sense and are an irritation and an irrelevance. The Centre Party is moving left, does not know what it is and has an identity crisis. The Left (Vänster) are die hard Marxists who have camouflaged themselves. Any combination of parties which can command 45% of the votes will be able to form a government. In some circumstances with a split opposition 40% may be enough. 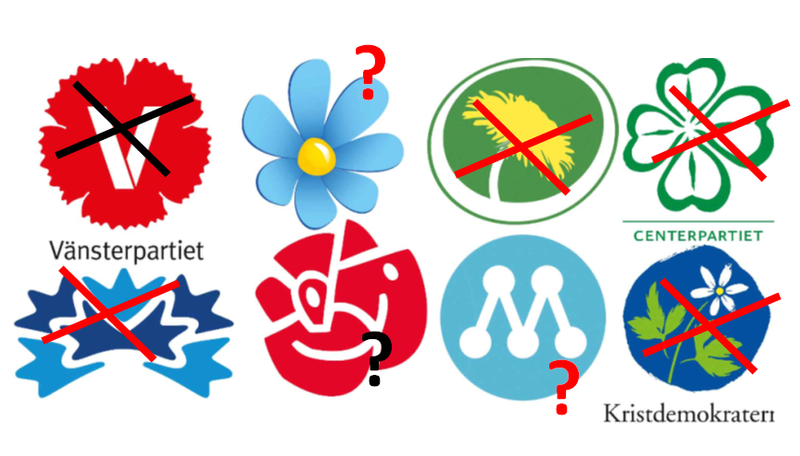 My gut feeling is that the country would accept a Grand Coalition between the Moderates and the Social Democrats but a coalition of the Moderates with the Sweden Democrats would need another 5%+ party to support. It makes an interesting mathematical puzzle. Global warming theory is in fact so malleable that it predicts anything. More cold, less cold. More snow, less snow. And what’s even more amazing is that climate change can be averted by just increasing your taxes. But what nobody ever reports on — because it would be boring — are the storms and severe weather events that haven’t happened. For example, U.S. tornado counts have been running below average, or even at record lows, in recent years. Amazingly, the low tornado activity has been blamed on climate change. So, too, have actual tornado occurrences! What a grand and gloriously useful theory global warming provides us. Winters in the U.S. are notoriously variable. Typically, if it’s warm in the East, it’s cold in the West. This is exactly what has happened this winter, except for this brief reversal before winter’s end. Normal people call it weather. More enlightened people, in contrast, call it climate change. Next winter it could be the opposite. No one knows. Like death and taxes, though, what is certain is that anything “unusual” that happens will somehow be blamed on your SUV. 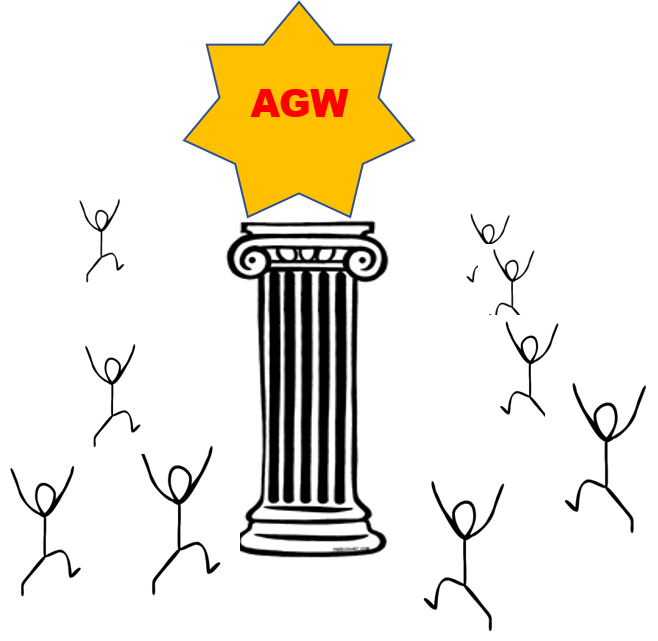 Too much rain, too little rain, drought, flood, storms cyclones, hurricanes and – for the true fanatics – even earthquakes and volcanic eruptions are somehow due to global warming (which of course means carbon dioxide emissions). I find the European statements (and especially the Swedish government’s) about “climate goals” particularly arrogant and idiotic. “The government’s goal is for Sweden to be a global role model in climate conversion”. They really think that they can change the climate? From what to what? The arrogance is boundless. Fake news in Sweden is nothing new – it is mainly by omission of course. Politically unpalatable stories are generally ignored or downplayed by a docile main stream media which never questions the basis of political correctness. They have also made a god of multi-culturalism and cannot (or will not) distinguish between multi-ethnic and multicultural (A “society” – to be a society – can be multi-ethnic but not multicultural). 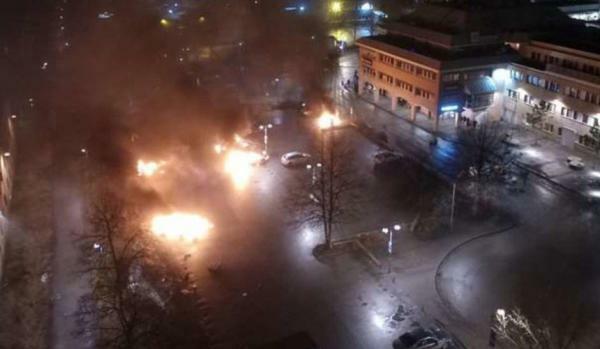 After what seemed to be another “ignorant” Trump comment about Sweden, he has been proven to be correct in substance if not in timing by the extensive riots in Rinkeby (an immigrant dominated suburb of Stockholm) yesterday. What he said was “You look at what’s happening last night in Sweden. Sweden, who would believe this? Sweden. They took in large numbers. They’re having problems like they never thought possible”. His reference to “last night” was wrong but the rest was spot on. Of course there was high indignation from Sweden in general and from the liberal/left in particular, but their high dudgeon may prove to be badly misplaced. It would appear the mainstream media (along with several celebrities and Swedish politicians) is going to be apologizing to President Trump once again. Having spent the entire new cycle trying to ignore the immigrant crisis facing Sweden, and pin the ignorant tail on Trump, both Dagbladet and Expressen reports riots breaking out in the highly immigrant concentrated Stockholm borough of Rinkeby, Sweden with police firing warning shots as 100s of young people throw stones and burn cars. During the evening hundreds of young people gathered in the center of Rinkeby, well known for its high concentration of immigrants and people with immigrant ancestry. In June 2010, Rinkeby was the scene of riots and attacks against the local police station and Rinkeby is the region in which the ’60 Minutes’ crew were attacked in 2016. ……. warnings of increasing radicalization among Sweden’s Muslims – warnings he started to broadcast a decade ago – now seem eerily prophetic in light of an Associated Press investigation that found Stockholm to be a breeding ground for jihadists among Swedish Somalis. According to the AP report, which first ran Jan. 24, an al-Qaida-linked group is busy recruiting anti-government fighters among Somali youths living in Rinkeby. A suburb of Stockholm, Rinkeby has earned the nickname of “Little Mogadishu” because of the number of Somalis living there. Rinkeby is also the center of the recruiting efforts of al-Shabab, a group with ties to al-Qaida. they believe that keeping silent may make it go away. Donald Trump is not big on academic, rational, logical thinking. He reacts from the gut and, at least in this instance, his gut emotions about Sweden are not wrong. The Swedish population will pass 10 million later today. 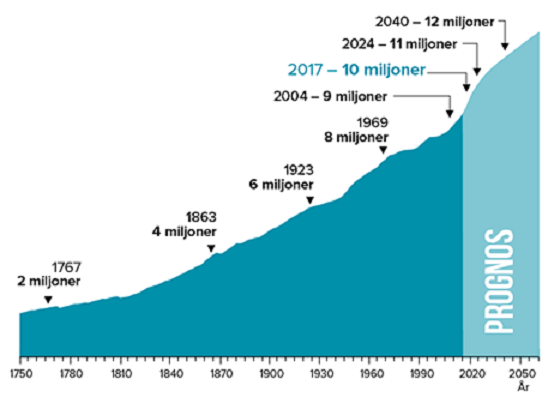 In 1969, 8 million people lived in Sweden. It took 35 years before the population passed 9 million in 2004. But only 13 years later, sometime in the first quarter of 2017, we will be more than 10 million inhabitants. Rapid growth will continue in the coming decades and we can be 12 million already by 2040. It should reach 10 million by around noon. The population increase in the last 50 years has been quite “healthy” and robust in demographic terms. In Europe, Sweden has perhaps the most robust development of demographics with respect to the ratio of non-working (under 19 and over 65) to working population (20 -65). And that has been thanks, in spite of falling fertility rates, mainly to immigration and the slightly higher fertility rate among newcomers (though that comes down quickly to the prevailing rate). Currently around 17% of Sweden’s population was born outside Sweden. This will increase to be over 20% by 2040. The Swedish pensions system is less under pressure than in Southern and Eastern Europe. Even Germany and France and the UK have a somewhat lower pensions risk because of net immigration. However in all these countries an increase of the regular pension age from 65 to 70 can be expected before 2040.